Bearberry, which has the scientific name Arctostaphylos Uva-Ursi, and is called by other names such as hogberry, rockberry, beargrape, kinnikinnik, manzanita, mealberry, red bearberry, Uva ursi, and wildcranberry is cultivated in Central and Northern Europe but is also abundant in North America. Bearberry grows to a height of around 20 centimeters. It has a thick-surfaced bark that is usually covered in fine, silky hairs, and oval leaves that are around 1.5 cm to 2 cm in length. Its fruit looks like the American cranberry while its flowers are either pink nor white, have five distinct petals, and are six millimeters in length. An infusion made from the stems of bearberry was once used by some Native American tribes to prevent miscarriage in their women and to aid in the faster recovery of women who have just given birth. Bearberries are called as such as they have been reportedly said as the favorite fruits of bears. Bearberry can serve as a natural diuretic. It has been used to treat bladder conditions such as cystitis (inflammation of the urinary bladder), urethritis (inflammation of the urethra), nephritis (inflammation of the kidney), urolithiasis, and other urinary tract infections. It also increases the frequency of urination, providing for the elimination of salt, water, and toxic wastes in the body, thereby ensuring the proper functioning of organs. Aside from this, bearberry is also found to be effective in hindering the formation of kidney stones by breaking them down into small parts so that they can easily pass through the urethra and out of the body via urination. Bearberry leaves can be smoked to relieve headache pain, although doing so is highly illegal in many areas, as bearberry has narcotic effects, in the same way that the cannabis plant also has. 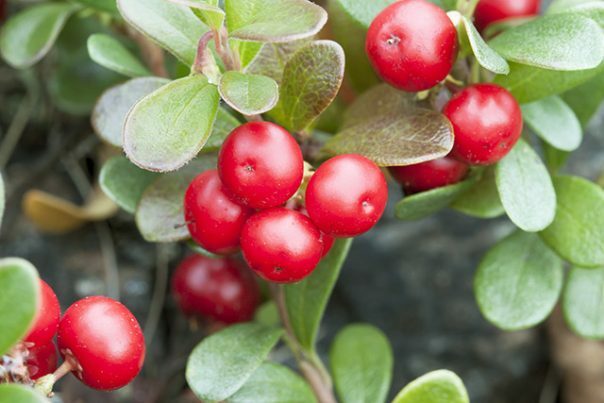 A concoction made from bearberry can also treat sore gums, burns, canker sores, and minor abrasions. It also addresses joint pains such as arthritis, backache, or rheumatism. Bearberries, when added to cosmetics amd skin care products, are a natural skin whitener. They are also good in removing acne scars, age spots, freckles, and melasma from skin. Bearberry leaves have polyphenolic compounds which have antioxidant propertis to fight against free radicals that cause wrinkles an fine lines in your face. Bearberries can also act as a natural sunblock to protect your skin from damage after too much sun exposure. Bearberries can also prevent gastrointestinal issues. They stop the proliferation of bacteria such as Escherichia coli, Proteus vulgaris, and even Staphylococcus, which cause intestinal infections. The tannin in bearberries help prevent occurrences of diarrhea and dysentery. Bearberry contributes to cleansing the bladder, boosting the immune system, getting rid of headaches, protecting the pregnant mother, speed up the healing process, alleviating inflammation, and protecting the gut. Hydroquines, which are chemical compounds that are found in bearberries, have antibacterial properties that are designed to protect the immune system. Bearberries do not have an appealing taste. They do, however, taste fine when prepared as a marmalade. Bearberry is used as an ingredient in skin care products – as it has astringent and disinfectant properties – and in food supplements. Bearberry is also used to make teas. Are you getting tired of the same old strawberry jam? Here is a recipe for bearberry jam. Bearberries, when added to cosmetics and skin care products, are a natural skin whitener. Bearberries have antibacterial properties that are designed to protect the immune system. Bearberries can prevent gastrointestinal issues.